Why is it so hard for us to surrender to learn and grow? I believe that there are many leaders who are capable of identifying areas for improvement. They can admit to shortcomings, and with appropriate information and practice, improve and master them. However, some leaders suffer from addiction. It is difficult for them to surrender to recover. Perhaps it was never labeled it as such because after all, the word addict has a host of negative, socially constructed implications such as out of control/impulsive, disconnected from others, feeding a state of “high”, and destined for catastrophe and tragedy. Please keep in mind that there are addictions that are genetic or physiological and as such, outside the purview of this of posting. The type of addictive behavior that is addressed here is one that is bred and sustained through the stages of addiction outlined below. Belief System – Addiction starts with a belief system that is the culmination of assumptions, judgements, myths, and experiences that we hold as reality. These beliefs underpin our decisions, interpretation of the outside world, judgements of others and their behaviors, and how life is managed and sustained. This belief system is not limited to addicts. We all have deep-rooted belief systems. Impaired Thinking – The belief system is distorted an d limited and it usually leads to impaired thinking. Noticeable early warning signals are denial and blame. Addicts usually deny there is a problem and blame the outside world or others and minimize their responsibility. 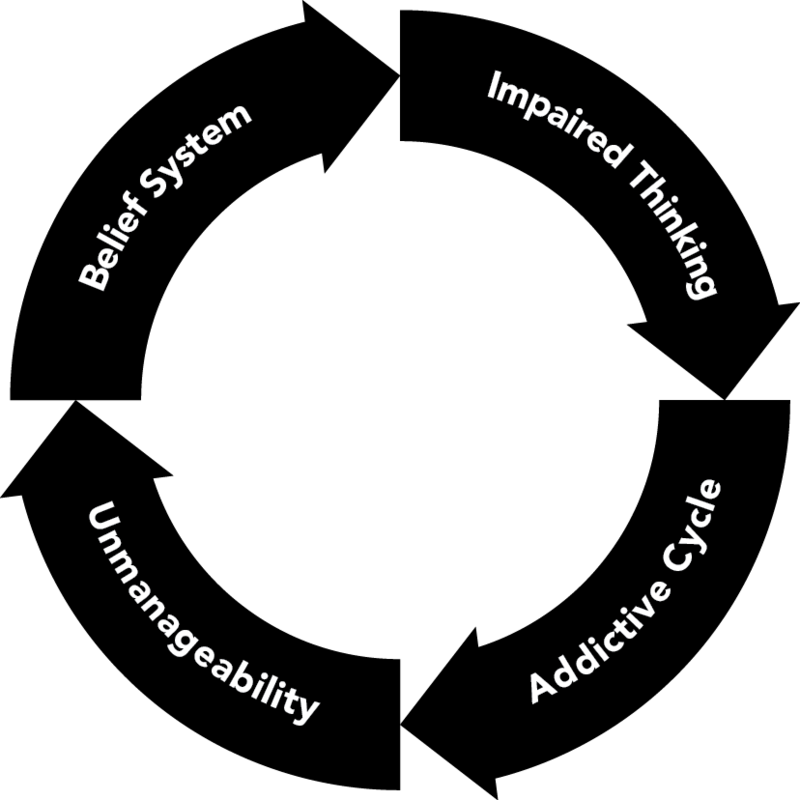 The Addictive Cycle – Driven by the belief system and impaired thinking, a preoccupation or obsession is formed. It is akin to a trance-like state where the addict loses touch with the realities of the world. He focuses inordinate levels of attention and energy on particular aspects of their belief system. This leads the addict to ritualize or habitually perform actions that are impulsive and compulsive. The addict experiences a euphoric state of “high”. Information and feedback to the contrary cause cognitive dissonance for the addict and therefore are often dismissed and not really heard. Unmanageability – Eventually the impulsive and uncontrollable addictive behavior leads to a series of smaller breakdowns, and if left unresolved and unattended, to more significant and damaging tragedies and potentially catastrophes1. Presented in this manner, leaders who are initially shocked and in denial of their addictions pause and may become more reflective. This often is the first glimmer of hope. Examples of this type of addictive thinking and behavior is a common occurrence. After all, did the executives at Enron such as Ken Lay and Jeffrey Skilling not follow this path? Were they not in a trance-like state disconnected from the realities of the outside world, dismissive and even incredulous with anyone attempting to point out the dysfunctionalities inherent in their belief system and impaired thinking and in the rituals and behaviors that had followed? And what of the disastrous addictive thinking and behaviors of the Volkswagen executives who for years knowingly ignored the emission standards of numerous countries to maximize sales and profits. The road to recovery always starts with surrendering. Surrendering means admitting and taking responsibility for the addictive behavior. It means admitting that the force that has taken hold is greater than the power the individual has to control or regulate it to acceptable levels of risk and in the service of their followers. It means that the leader has to become comfortable with vulnerability be able to look at the addictive behavior head on and to latch onto a force or a cause greater than themselves. He identifies and commits to a “north star” that guides his thinking and actions. It could be the values that he wants to reconnect with, or a spiritual calling or a cause. The leader then takes inventory of the effects of his behavior, admits it, confronts it and if possible, tries to repair the harm. From a neurological perspective “unlearning” is more difficult than learning. Try changing the password on your hand held device and notice how many times you type in the old password before you create a new pathway in your brain that looks for the new word first. Our addictions are formed over years and therefore difficult to override. Perhaps the most difficult part of our journey is that up to a certain point these behaviors helped us succeed and even rewarded. The same leader who succeeded through his perseverance and hard work is now exhibiting workaholic behaviors. The same leader who was rewarded for his decisiveness is addicted to power and starts to exhibit his tyranny at home, with friends and during his son’s baseball games, etc. The good news is that addiction can be overcome. It starts with surrendering. Which means one cannot numb it, deny it, blame it on others, nor sink into disabling shame, regret, resignation and hopelessness. It means having the courage to ask for help. Past thoughts, behaviors, and decisions don’t have to define who you are. Adapted from the writings of Patrick Carnes, PhD – nationally recognized expert on the subject of addiction and addiction recovery. Have you exhibited addictive behaviors? Were you able to surrender? How? If you have overcome it, how are you sustaining your progress?